30-year fixed-rate mortgage (FRM) averaged 3.9 percent with an average 0.5 point for the week ending June 22, 2017, down from last week when it averaged 3.91 percent. A year ago at this time, the 30-year FRM averaged 3.56 percent. 15-year FRMthis week averaged 3.17 percent with an average 0.5 point, down from last week when it averaged 3.18 percent. A year ago at this time, the 15-year FRM averaged 2.83 percent. 5-year Treasury-indexed hybrid adjustable-rate mortgageARM) averaged 3.14 percent this week with an average 0.5 point, down from last week when it averaged 3.15 percent. A year ago at this time, the 5-year ARM averaged 2.74 percent. May existing-home sales rose 1.1 percent to a seasonally adjusted annual rate (SAAR) of 5.62 million — up from a downwardly revised 5.56 million in April. This month’s sales pace is 2.7 percentage points above May 2016 and is the third highest SAAR sales pace over the past year. 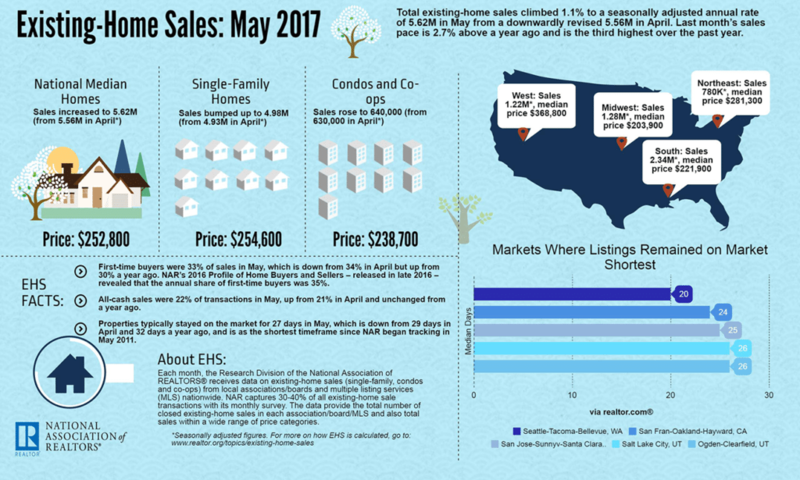 The median existing-home price for all housing types in May rose 5.8 percentage points to $252,800, which marks the 63rd consecutive month of year-over-year gains. Single-family home sales were at a SAAR of 4.98 million — a 1.0 percentage point month-over-month increase and a 2.7 percentage point year-over-year increase. The sales price for single-family homes increased by 6.0 percentage points to $254,600. 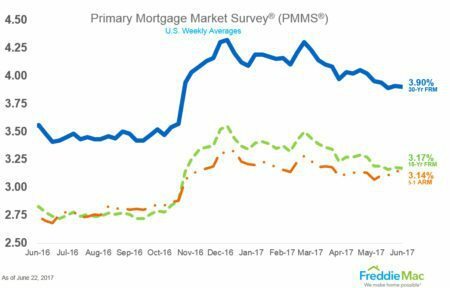 The 30-year fixed mortgage rate on Zillow® Mortgages is currently 3.68 percent, down three basis points from this time last week. The 30-year fixed mortgage rate fell Tuesday, then hovered between 3.65 percent and 3.73 percent for the rest of the week before settling at the current rate. The rate for a 15-year fixed home loan is currently 2.96 percent, while the rate for a 5-1 adjustable-rate mortgage (ARM) is 2.94 percent. Below are current rates for 30-year fixed mortgages by state. Additional states’ rates are available at: http://www.zillow.com/mortgage-rates.